A special event to celebrate 15 years of the Millennium Cup – a Masters! 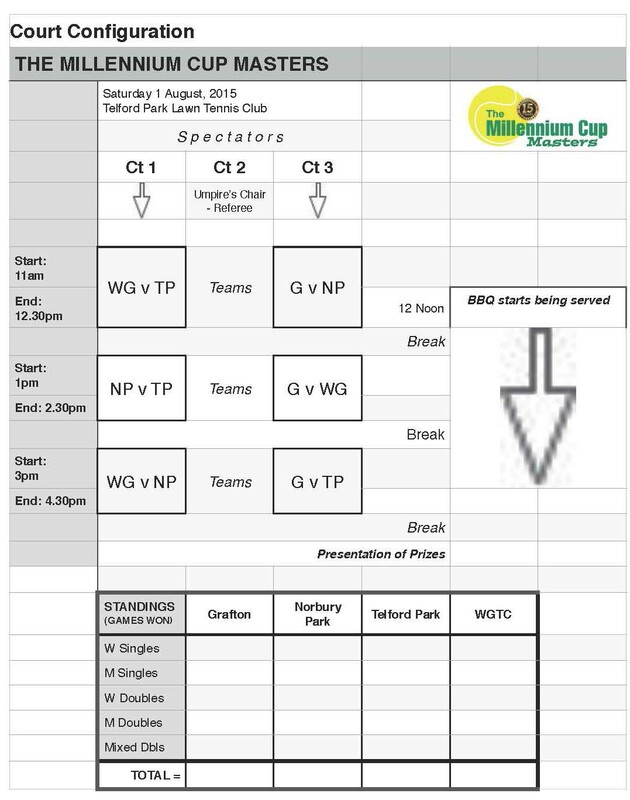 In celebration of the 15 years of the Millennium Cup Competition, a Fast4 (short format) league competition was played over one day on Saturday 1 August, between four of the five Millennium Cup participant teams, from 11am until approx 5pm, hosted by Telford Park Lawn Tennis Club, after which prizes were presented to the winners. This was a quick-fire, fast, fun day of tennis with a highly competitive edge! The aim was to win as many games as possible and the team accumulating the most games won at the end of the day was Woodfield Grove. A barbecue ran alongside from 12 Noon onwards to which all Millennium Cup participants, past and present, were invited to attend, as well as participant club members. The criteria for players entering the Masters was the same as for the Millennium Cup competition under the current Standard of Play criteria. Team captains enlisted players selected for their draft under the following rules. The captains of those players competing must email the list to the referee by close of play on Sunday 26 July. The cost of providing balls, lunch and individual prizes will be met by the Millennium Cup Organising Committee. An additional contribution towards the cost of the barbecue will also be made. It is a condition of entry that all team players will make themselves available for the full day of play (11am – 5pm). Acceptances will be limited to 10 players per club. There will be an additional sign-up for the barbecue, which is optional, and will be provided at a modest charge per person (other than competing teams, who will not be charged). Four captains, from Grafton, Norbury Park,Telford Park and Woodfield Grove, will be advised from among the entries to the referee. The captains, who are eligible to play in matches, will select players from their club’s final list of entries to make up their teams. There will be a minimum of 5 and a maximum of 8 players per team. Each team will comprise of at least 2 men and 2 women. Each captain may select additional players from their list of entries to make up their team squad. Any remaining players on the entry lists may be nominated to each team as reserves. There will be no more than 10 players in any team, including up to 2 reserves. If there are any subsequent withdrawals after the team selection is made, the captain may replace the player from the reserve list up until 10am on the day of the competition, after which time reserves will not be eligible to play in matches. The referee will determine by a toss of a coin which team in each tie is designated to be at ‘home’, with the opposing team becoming the ‘visitors’. Teams will play three one and a half-hour ties each (‘Tie Period’) over the course of the day, with a fifteen minute comfort break between each, as per the attached schedule. Each captain will nominate his or her team players to play in each of the rubbers ahead of the start of the tie. Players may only be nominated to play in a maximum of 2 rubbers at the start of the tie. Every player in the team must be played at least once per tie. The rubbers may be played in any order and the order of play in each tie will be decided by the ‘home’ team captain and advised to the opposing visiting team captain before play in that tie period begins, after which the order may not be changed. During play in the tie, substitutions of team players are allowed at any time at the discretion of the captains. Players of either gender may be substituted once a match is under way. No player, however, may be substituted more than once until all team members have been played at least once in the tie. Either captain may suspend any rubber (for completion at a later stage of the tie period) by calling ‘Time Out’ and the next rubber in the order of play will then immediately commence. If there is sufficient time at the end of the period, any uncompleted match(es) may be concluded until the referee declares the tie period to be over. Once time is called on the tie by the referee on conclusion of the tie period, play will cease immediately and the score at that time will stand and be recorded by both captains. The aim is win 4 games before the opposition does, with no advantage games. If the serve clips the tape and lands in the service box, there is no let and play continues. In doubles either the receiver or their partner can take the return. At deuce there is a ‘Power Point’ (or sudden death), with the receiver choosing which side to take the serve. In doubles the receiving pair decides who returns the serve. At 3 games all a ‘Short Tie-break’ is played, with the first to 5 points winning the match. A Power Point determines the winner at 4 points all. All singles and doubles matches are played as one short set – i.e. the first to win 4 games. Matches are played using no-advantage scoring (‘Power Point’ i.e. sudden death), with the receiver choosing the service side when the game reaches deuce. The winner of the Power Point wins the game. No service lets are played, meaning if the ball hits the net cord on a serve and lands (or bounces) within the correct service box, play continues. In doubles, if the ball hits the net cord on the serve and lands (or bounces) within the correct service box, either player can return the ball (e.g. the ball hits the net cord and drops over the net, the non-receiver can move across and return the serve). At three (3) games all, a Short Tiebreak will be played with the first to 5 points, with sudden death at 4-4. • The player whose turn it is to serve at the commencement of the tiebreak (Player A) will serve two (2) points. • The opposing player (Player B) will then serve two (2) points. • Player A (or team mate of Player A in doubles) will then serve two (2) points. • Players will change ends only after the first four (4) points have been played. • Player B (or team mate of Player B in doubles) will then serve the following two (2) points. • If the score reaches 4-4, Player B (or the team mate of Player B in doubles) will serve the final point of the tiebreak with Player A choosing which side the ball will be served. Play shall be continuous with no sit-down during the change of ends during a set since the aim is to score as many games as possible and time is of the essence. The players changing ends, therefore, have to be ready to play within 60 seconds of the previous game’s completion. Players are only permitted to sit down at the end of a set when a ‘set break’ of ninety (90) seconds is allowed for team consultation and refreshment. The ‘Set Break’ time starts from the moment that last set point finishes until the first service of the next set is struck for the next point. Captains will monitor the opposing team’s time-keeping and report any shortcomings to the referee, who may dock the offending team between 1-4 games depending on the severity of the misdemeanour. On completion of a match, the captains have 90 seconds in which to prepare and to start the next match scheduled. The captains will keep track of the score on court and keep the scoreboards updated using conventional scoring. If the captain is playing, he/she may nominate a member of the team to take over these duties. At the conclusion of the tie, the captains will hand the score of total games won in to the referee. The team that wins the most games, accumulated from all five rubbers, wins the tie. The team with the most accumulated games won, wins the League. Conventional scoring is to be used for matches and numeric for Short Tiebreaks. The captains will record each substitution and score on their scoresheet. The referee will maintain a running total of the overall league scores. Four new balls will be provided at the start of each tie.